"Won't You Be My Neighbor?" redirects here. For the film, see Won't You Be My Neighbor? (film). Mister Rogers' Neighborhood (sometimes shortened to Mister Rogers) is an American half-hour educational children's television series that was created and hosted by Fred Rogers. The series Misterogers debuted on October 15, 1962, on CBC Television. In 1966, Rogers moved back to the United States creating Misterogers' Neighborhood, later called Mister Rogers' Neighborhood, on the regional Eastern Educational Network (EEN, a forerunner of today's American Public Television). The US national debut of the show occurred on February 19, 1968. It aired on NET and its successor, PBS, until August 31, 2001. The series is aimed primarily at preschool ages 2 to 5, but it was labelled by PBS as "appropriate for all ages". Mister Rogers' Neighborhood was produced by Pittsburgh, Pennsylvania public broadcaster WQED and Rogers' non-profit production company Family Communications, Inc., previously known as Small World Enterprises prior to 1971; the company was renamed The Fred Rogers Company after Rogers' death. In May 1997, the series surpassed Captain Kangaroo as the longest-running children's television series, a record the series held until July 2002, when Sesame Street beat Mister Rogers' record. The series could be seen in reruns on most PBS stations until August 31, 2007, when it began to be removed by various PBS stations, and was then permanently removed from the daily syndicated schedule by PBS after August 29, 2008. Eleven years after Mister Rogers' Neighborhood concluded, PBS debuted an animated spin-off, Daniel Tiger's Neighborhood. A 50th-anniversary tribute show, hosted by actor Michael Keaton (who got his start on the show), titled Mister Rogers: It's You I Like, premiered on PBS stations nationwide on March 6, 2018. The series had its genesis in 1953, when Rogers and Josie Carey joined the newly formed public television station WQED. On April 5, 1954, WQED debuted The Children's Corner, a program featuring Rogers as puppeteer and composer with Carey as host and lyricist, in an unscripted weekday afternoon live television program. It was this program where many of the puppets, characters and music used in the later series were developed, such as King Friday XIII, Daniel Tiger, and X the Owl. It was also the time when Rogers began wearing his famous sneakers, as he found them to be quieter than his work shoes while he was moving about behind the set. The show won a Sylvania Award for best children's show, and was briefly broadcast nationally on the NBC Television Network. Rogers moved to Toronto, Ontario, in 1961 to work on a new series based on The Children's Corner, called Misterogers, a 15-minute program on CBC Television. Misterogers aired on CBC for about four years and a number of the set pieces that he would take with him back to the United States, such as the trolley and castle, were created for the Canadian program by CBC designers and in collaboration with producer Bruce Attridge. Most importantly, Rogers appeared on camera in the new show rather than only appearing through puppets or characters. Fred Rainsberry, head of Children's Programming at CBC, persuaded Rogers to appear on camera in the new show (which he named after Rogers) after seeing him interact with children. Ernie Coombs, one of the Americans whom Rogers brought with him to help develop the CBC show, would remain with CBC after Rogers returned to the United States. Coombs first appeared as Mr. Dressup in the CBC program Butternut Square, conceived and produced by Attridge. Coombs then helped to develop what became Mr. Dressup which continued for several decades. In 1966, Rogers acquired the rights to his program from the CBC and moved the show to WQED in Pittsburgh, where he had worked on The Children's Corner. He renamed the show Misterogers' Neighborhood, which initially aired regionally in the northeastern US through EEN, including educational stations in Boston, Washington, D.C., and New York City. The 100 episodes of the half-hour show incorporated the "Neighborhood of Make-Believe" segments from the CBC episodes with additional reality-based opening and closing material produced in Pittsburgh. The series was cancelled in 1967 due to lack of funding, but an outpouring of public response prompted a search for new funding. In 1967, The Sears Roebuck Foundation provided funding for the program, which enabled it to be seen nationwide on National Educational Television; taping began on September 21, 1967 for the first national season. The first national broadcast of Misterogers' Neighborhood appeared on most NET stations on February 19, 1968. In 1970, when PBS replaced NET, it also inherited this program. Around the same time the show had a slight title change, to the more-familiar Mister Rogers' Neighborhood. The show was broadcast from February 19, 1968 to February 20, 1976, and again from August 20, 1979 to August 31, 2001. The final episode was taped on December 1, 2000. The studio at WQED in Pittsburgh where the series was taped was later renamed "The Fred Rogers Studio". During each half-hour segment, Rogers speaks directly to the viewer about various issues, taking the viewer on tours of factories, demonstrating experiments, crafts, and music, and interacting with his friends. Rogers also made a point to simply behave naturally on camera rather than acting out a character, stating that "One of the greatest gifts you can give anybody is the gift of your honest self. I also believe that kids can spot a phony a mile away." The half-hour episodes were punctuated by a puppet segment chronicling occurrences in the Neighborhood of Make-Believe. Another segment of the show consisted of Rogers going to different places around the neighborhood, where he interviews people to talk about their work and other contributions that focused on the episode's theme, such as Brockett's Bakery, Bob Trow's Workshop, and Negri's Music Shop. In one episode, Rogers took the show behind-the-scenes on the set of The Incredible Hulk, which aired on CBS from 1978 to 1982. At the start of each episode, the show's logo appears as the camera pans slowly over a model of the neighborhood, while the "Neighborhood Trolley" crosses several streets from left to right as the text reads "Mister Rogers Talks About...", as the camera goes from the neighborhood to inside the Rogers' television house. From 1979 to 1981, an alternate version of the opening sequence was used. Usually, the camera goes from the neighborhood to out on the porch of the Rogers' television house, where the viewers see Fred Rogers coming for a visit before he enters the house. This is the same model electric trolley that later in the program will transport viewers into the Neighborhood of Make-Believe. 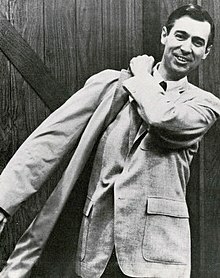 After the camera goes from the neighborhood to inside the Rogers' television house, Fred Rogers is seen coming home with his jacket on, singing "Won't You Be My Neighbor?". He goes into the closet door by taking off his jacket, and hanging it up, and grabs a cardigan zipper sweater to put on. After that, he takes his dress shoes off, and grabs a pair of blue sneakers to put on. One of Rogers' sweaters now hangs in the Smithsonian Institution, a testament to the cultural influence of his simple daily ritual. At the end of each episode, Rogers sang "It's Such a Good Feeling" (a different song, "Tomorrow" was used from 1968–72) when he took off a pair of blue sneakers as he says "You're alive" in a higher toned voice, and grabs his dress shoes to put it back on, and then, he snaps his fingers two times. After that, Rogers goes into the closet door by taking off his cardigan zipper sweater, and hanging it up, and grabs his jacket to put it back on. Before the closing credits, Rogers got ready to go out the door by reminding the viewers: "You always make each day a special day. You know how: By just your being you/yourself. There's only one person in the whole world that's like you, and that's you. And people can like you just/exactly the way you are. I'll be back next time. Bye-bye!". During the closing credits, which is complete with the show's logo and the episode number, the camera would perform a reversed version of the opening sequence's pan shot, while the "Neighborhood Trolley" crosses streets from right to left. Starting in 1979, episodes were grouped into week-long series, with each series focused on a particular topic. Rogers' monologues throughout the week explore various facets of the topic, and the ongoing story from the Neighborhood of Make-Believe serves as illustration. Rogers covered a broad range of topics over the years, and the series did not shy away from issues that other children's programming avoided. In fact, Rogers endeared himself to many when, on March 23, 1970, he dealt with the death of one of his pet goldfish. The series also dealt with competition, divorce, and war. Rogers returned to the topic of anger regularly and focused on peaceful ways of dealing with angry feelings. Beginning in the third season, Mister Rogers always made a clear distinction between the realistic world of his television neighborhood and the fantasy world of Make-Believe (prior to that, the line was blurred somewhat as he would often talk about it as it were real and he had a direct line of contact with the characters in it). He often discussed what was going to happen in Make-Believe before the next fantasy segment was shown ("Let's pretend that Prince Tuesday has been having scary dreams..."), and sometimes acted out bits of Make-Believe with models on a table before the camera transitioned to the live-action puppet rendition. The miniature motorized trolley, which was known in character form as "Trolley", with its accompanying fast-paced piano theme music, was the only element that appeared regularly in both the realistic world and Make-Believe: it was used to transport viewers from one realm to the other. Rogers, however, was mentioned from time to time in Make-Believe, particularly by Mr. McFeely, who appeared occasionally in the Make-Believe segments and seemed to form a link between the two worlds. The idea of the trolley came from Rogers. When he was young, there had been lots of trolleys operating in Pittsburgh, and he liked riding on them. This reality/fantasy distinction put Rogers' series in sharp contrast with other children's series, such as Sesame Street and Captain Kangaroo, which freely mixed realistic and fantastic elements. Trolley was a character in its own right. Often when it crossed into the Neighborhood of Make Believe, it would stop and have a "conversation" with King Friday XIII (by moving back and forth slightly and making bell noises to respond to Friday) then continue on. Trolley also truly showed the difference between the worlds during the week when the three youngest puppet characters (Daniel Striped Tiger, Prince Tuesday, and Ana Platypus) prepared for and went to school for the first time, as it played the school bus. When in Mister Rogers' house, it simply had two pieces of yellow construction paper shaped and drawn like the profile of a school bus stuck to each side of it, but in the Neighborhood of Make-Believe, it looked like a real school bus except with trolley wheels. The series featured "Picture Picture", a rear-projection motion picture and slide projector, whose screen is encased with a picture frame. In early episodes, Picture Picture would show various films or slides at Mister Rogers' command; after the material was presented, Mister Rogers would thank Picture Picture, in which it will return a "You're Welcome" on its screen. After 1970, Picture Picture no longer operated magically, becoming merely a projector; Mister Rogers would insert a film, slides or videotape through a slot on the side, then show the material using a wired remote control. When Picture Picture was not used, a different painting would be displayed on its screen. Often it would display the words "Hello" or "Hi" at the opening. The series was also notable for its use of jazz-inspired music, mostly arranged and performed by Johnny Costa, until Costa's death in 1996, when he was succeeded by Michael Moricz for the remainder of the series. The music was unique in its simplicity and flow that blended with the series' sketches and features. The music was usually played live during taping. Lyrics and melodies were written and sung by Rogers, who created more than 200 original songs. When Fred Rogers died in 2003, PBS's website provided suggestions to parents on how to respond to children who ask about Rogers' death. Beginning September 3, 2007, some PBS affiliates began replacing the show with new programs such as Super Why!, WordGirl and WordWorld. In June 2008, PBS announced that, beginning in late 2008, it would stop broadcasting Mister Rogers' Neighborhood as part of its daily syndication lineup to member stations, instead airing the program only once a week over the weekend. Milwaukee PBS, for example, still carries the show once a week, on Sunday, over its primary HD/SD channel. Beginning on September 1, 2008, the Neighborhood program was replaced by new programming such as Martha Speaks, Sid the Science Kid, and an update of The Electric Company. However, individual member stations have the option of airing the Neighborhood independently of the PBS syndicated feed, with series home WQED in particular continuing to air the series daily until 2010. There was a campaign in 2008 and 2009 to urge PBS and all member stations to bring the show back seven days a week. To celebrate the 50th anniversary of the series' national premiere, PBS aired select episodes of Mister Rogers' Neighborhood for a week in February 2018. The song "Won't You Be My Neighbor?" was written by Fred Rogers in 1967 and was used as the opening theme for each episode of the show. In the first three seasons of the show, during which new episodes were constantly being produced, each show ended with the song "Tomorrow", which was written by Rogers' former colleague, Josie Carey. Starting with Season 4 in 1971, "Tomorrow" was used only on Monday through Thursday episodes, and a new closing song, which is titled as "The Weekend Song", was used only on Friday episodes as the program wouldn't return until Monday. Eventually, the "Tomorrow" song was removed entirely due to copyright issues, and by 1973, Rogers sang "It's Such a Good Feeling" at the end of each episode. Prior to 1973, the original version of "It's Such a Good Feeling" was used as part of Mister Rogers' general repertoire of songs. When "It's Such a Good Feeling" became the closing theme for Mister Rogers' Neighborhood in 1973, it used a rewrite of "The Weekend Song" at the end, using only the first four lines: "And I'll be back when the day is new, and I'll have more ideas for you. And you'll have things you'll want to talk about; I will too". This was only used on Monday through Thursday episodes. On Friday episodes, the lyric was changed to "week" instead of "day". On early episodes of this season, the line was originally written as "When tomorrow is new". Michael Moricz, who took over as music director after Costa's death and served until the end of the series in 2001. Even after Costa's death in 1996, much of the music heard on the program continued to be Costa's and his name continued to be listed in the show's closing credits as one of its Musical Directors. The first broadcast of Mister Rogers' Neighborhood was on the National Educational Television network on February 19, 1968; the color NET logo appeared on a model building at the beginning and end of Mister Rogers' Neighborhood from 1969 to 1970. When NET ceased operations, the series moved its successor network PBS, even though episodes up until the end of the fourth season in May 1971 were still copyrighted by and produced for NET. The series' first season (1968) consisted of 130 episodes, produced in black-and-white. For seasons 2–8 (1969–75), the show produced 65 new color episodes each year. By the end of season 8, this meant there was a library of 455 color episodes which could be repeated indefinitely. As a result of dwindling funds needed to produce the show, the decision was made to wrap-up production of the series, much to Rogers' chagrin. As a consequence, season 9 (1976) consisted of only five episodes. These five new episodes (which aired the final week of original episodes of the so-called "first series") featured Mister Rogers in his workshop, watching scenes of past episodes of his series, which he recorded on videocassettes and kept on the shelf in his workshop. On the Friday episode of that week (February 20, 1976), he reminded viewers that they, too, could watch many of those old episodes beginning the following week. Two primetime episodes were produced and aired as specials: a Christmas show in December 1977 and a "springtime"-themed show in June 1979. In 1978, with more funding secured, production of the series resumed, with an eye towards "freshening up" the show by producing 15 new episodes per year. These "second series" episodes, which began airing in August 1979, would be mixed in with the already-airing cycle of repeats from the so-called "first series" (i.e., the color episodes of seasons 2–9, aired from 1969–76). The series aired 15 new episodes annually between 1979 and 1993. As well, there were occasional "Mister Rogers Talks with Parents About..." specials, which featured panelists discussing ways in which parents could talk to their children about the issues discussed on Mister Rogers' Neighborhood. These specials were usually aired on weekends, just prior to the airing of a new batch of Monday-to-Friday episodes. Beginning in 1994, the production schedule was changed so that 10 new episodes a year were produced instead of 15. Shortly thereafter, as of August 11, 1995, the episodes from the "first series" (1968–76) were withdrawn from the repeat schedule, since there were over 200 "second series" episodes available for broadcast, and many of the first series episodes had become outdated. The show's final years varied the number of episodes produced per season: season 26 (1995–96) consisted of 20 episodes, season 27 (1997) produced 10 episodes, seasons 28 and 29 (1998–99) both contained 15 episodes, and season 30 (2000) reverted to 10 episodes. The final season, season 31 (2001), consisted of only 5 episodes, centering on the theme "Celebrate The Arts". A few episodes from the "first series" are available for viewing in the Paley Center for Media, including the first episode of the series and the first color episode. A complete collection of episodes, including more than 900 videotapes and scripts from the show along with other promotional materials produced by Rogers or his Family Communications Inc. production company, exists in the University of Pittsburgh's Mister Rogers' Neighborhood Archives located in the Elizabeth Nesbitt Room in the university's School of Information Sciences Building. When PBS began re-airing the first 460 color episodes of the series in 1976, some of the earliest color episodes from 1969 and 1970 were re-edited with new voice-overs or footage. For example, in one 1970 episode where Mister Rogers demonstrates the noise-proof ear protectors that airport workers use on the tarmac, the film footage used featured a worker directing a United Airlines jet with its stylized "U" logo—which wasn't introduced until 1974. All of the episodes revised from the first series also included an extra segment following the closing credits, mentioning the episode number and additional companies that provided funding since these episodes originally aired, even though they had not provided funding at the time of original production. The black and white episodes of the first season were last re-run on August 21, 1970, just before NET was replaced by PBS. As of 2013[update], almost all of the 1979–2001 "second series" episodes are still in active rotation on a number of PBS stations. The only exception is the week-long "Conflict" series (episodes #1521–#1525), first aired during the week of November 7–11, 1983. The series/story arc covered the topics of war, bombs, and an arms race, and was created in response to the Invasion of Grenada, and the 1983 Beirut barracks bombings. The "Conflict" series was last aired on PBS during the week of April 1–5, 1996. Only a few episodes of the series have been released to DVD by Anchor Bay Entertainment, although some earlier compilation-based releases were issued on VHS by Playhouse Video during the mid-1980s. 100 episodes have subsequently been released as part of Amazon Video. A DVD set entitled the "It's a Beautiful Day Collection", containing 30 episodes, was released on March 27, 2018 by PBS. On May 11, 2017, streaming video platform Twitch announced with The Fred Rogers Company that all 886 episodes of Mister Rogers' Neighborhood would be streamed live on the Internet over an 18-day period (although several episodes were skipped over during the marathon, most notably the 1983 "Conflict" episodes). The marathon began on May 15, 2017 at Noon PT and ended on June 3, 2017. The marathon included many Mister Rogers episodes that had only aired once before. During the live stream, viewers were encouraged to support their local PBS station. Mister Rogers' Neighborhood joined other popular PBS shows, including The Joy of Painting and The French Chef, that have been streamed on the Twitch service. On March 20, 2018, Twitch began streaming a 90-episode marathon to commemorate Rogers' 90th birthday, followed by a repeat marathon of the series. The human characters who appeared in the Neighborhood of Make-Believe were mostly imaginary versions of people who lived in Mr. Rogers' "real" neighborhood. For example, Joe "Handyman" Negri is a jazz-guitarist who has taught music at several Pittsburgh universities and who operates the musical-instrument shop on Rogers' street. The non-make-believe version of Betty Aberlin was an actress. Audrey Roth operated a janitorial service in the real neighborhood, but was royal phone operator "Miss Paulifficate" in Make-Believe. Only Mr. McFeely, Mrs. McFeely, and Chef Brockett appeared substantially the same way in both Mr. Rogers' Neighborhood and the Neighborhood of Make-Believe. In addition to Bob Trow other regular puppeteers included Michael Horton, Lenny Meledandri (1980–2001), and Carole Switala. Michael Keaton made his first television role as a volunteer in 1975. He played an acrobat in a troupe called The Flying Zookeenies that performed for King Friday's birthday and was also in charge of running the Trolley. Thirteen in-series "operas" took place during the course of the series within the Make-Believe segments. Many of them feature American baritone John Reardon as a main character. The operas would encompass the entire episode, and would be seen after a brief introduction by Mr. Rogers. Additionally, a play, Josephine The Short-Necked Giraffe, first aired in 1989 as a tribute to the late John Reardon. Guests on the series ranged from cellist Yo-Yo Ma to actor and bodybuilder Lou Ferrigno of TV's The Incredible Hulk. (In a 2001 piece where celebrities were asked about their heroes, Rogers cited Ma as one of his heroes.) A 1968 visit by electronic music pioneer Bruce Haack resurfaced in the 2004 documentary Haack: King of Techno. Guests on Mister Rogers' Neighborhood were often surprised to find that although Rogers was just as gentle and patient in life as on television, he was nevertheless a perfectionist who did not allow "shoddy" ad-libbing; he believed that children were thoughtful people who deserved programming as good as anything produced for adults on television. Rogers appeared as a guest on some other series. On the children's animated cartoon series Arthur, for example, Rogers plays himself as an aardvark like Arthur. Later on, Arthur appears as a guest in hand-puppet form in a 1999 episode of Mister Rogers' Neighborhood in the Neighborhood of Make-Believe. Bill Nye, host of a science-themed program, and Rogers also exchanged appearances on each other's series, as did Rogers and Captain Kangaroo. Rogers additionally appeared in an episode of Sesame Street, where he explains to Big Bird that even if one loses a running race such as the one Big Bird had run against his friend "Snuffy", no hard feelings threaten to break the two of them apart. Big Bird himself also appeared in one episode of Mister Rogers' Neighborhood in the Neighborhood of Make-Believe. A prime time Christmas special, Christmastime with Mister Rogers, first aired in 1977. This special had François Clemmons introducing a storyteller and flutist friend to Rogers. They filmed several narrated segments of the stories François' friend told. The special also had the Neighborhood of Make-Believe segment which shows how they celebrated Christmas. The trolley had a banner on the roof that said "Merry Christmas" on one side, and "Happy Hannukah" on the other. This special was aired every Christmas season until 1982. This special's opening and close have Rogers walking through a real neighborhood while the titles roll rather than the model neighborhood used in the series. In 1994, Rogers created another one-time special for PBS called Fred Rogers' Heroes which consisted of documentary portraits of four real-life people whose work helped make their communities better. Rogers, uncharacteristically dressed in a suit and tie, hosted in wraparound segments that did not use the "Neighborhood" set. For a time Rogers produced specials for the parents as a precursor to the subject of the week on the Neighborhood called "Mister Rogers Talks To Parents About [topic]". Rogers didn't host those specials, though; other people like Joan Lunden, who hosted the Conflict special, and other news announcers played MC duties in front of a gallery of parents while Rogers answered questions from them. These specials were made to prepare the parents for any questions the children might ask after watching the episodes on that topic of the week. On March 6, 2018, a primetime special commemorating the 50th anniversary of the series aired on PBS, hosted by actor Michael Keaton. The hour-long special also features interviews by musician Yo-Yo Ma, musician Itzhak Perlman, actress Sarah Silverman, actress Whoopi Goldberg, actor John Lithgow, screenwriter Judd Apatow, actor David Newell, producer Ellen Doherty, and spouse Joanne Byrd Rogers, as well as clips of memorable moments from the show, such as Rogers visiting Koko the gorilla, Margaret Hamilton dressing up as The Wizard of Oz 's Wicked Witch of the West, and Jeff Erlanger in his wheelchair singing "It's You I Like" with Rogers. Earlier PBS specials include Our Neighbor, Fred Rogers in 1990 and Fred Rogers: America's Favorite Neighbor in 2003. A short special, Mister Rogers in Our Neighborhood by PBS station WUCF, described Fred Rogers's college years and family connections in Florida. Over the years, many television shows, exhibits and attractions have been named in tribute to Mister Rogers' Neighborhood. After three years as a traveling exhibit, the Children's Museum of Pittsburgh had "Welcome to Mister Rogers' Neighborhood" installed as a permanent exhibit in 2004. The planetarium show "The Sky Above Mister Rogers' Neighborhood" is a computer-animated adaptation of the television show for preschool-aged children. Idlewild and Soak Zone, an amusement park near Rogers' hometown of Latrobe, Pennsylvania has an attraction called "Mister Rogers' Neighborhood of Make-Believe" featuring a life-size trolley ride, designed by Rogers. This was shut down in 2014 to reopen as Daniel Tiger's Neighborhood in 2015. A children's play area at Monroeville Mall in the Pittsburgh suburb of Monroeville was named for the television show. Many of the artifacts from the set of Mr. Rogers neighborhood, including the tree of X the owl, the make-believe neighborhood and the inside entrance to Mr. Rogers home is on display at the Heinz History Center in Pittsburgh. Also included is a life figure of Mr. Rogers and a sweater he wore on the show. A kiosk containing artifacts used during the series is located on Concourse C of Pittsburgh International Airport, near the children's play area. The Mister Rogers' Neighborhood Archives at the University of Pittsburgh's School of Information Sciences is an academic resource and collection that contains correspondence, scripts, props, puppets, fan mail, 911 videotapes (3 episodes are missing, presumed wiped), and scholarly articles that show the cultural impact of Fred Rogers' work. A statue of Fred Rogers exists on the North Shore of the Allegheny River near Heinz Field at the surviving footing of the Manchester Bridge. The original trolley from the shows is on display at the Canadian Broadcasting Centre in Toronto, Ontario. A documentary feature film about the series, titled Won't You Be My Neighbor?, was released by Focus Features on June 8, 2018. Another documentary, Mister Rogers & Me, was shown at film festivals in 2010 and on PBS stations in 2012. An upcoming American biopic, titled A Beautiful Day in the Neighborhood starring Tom Hanks as Mr. Rogers is scheduled to be released on November 22nd 2019 by TriStar Pictures. On September 21, 2018, a Google Doodle was created in honor of Mr. Rogers. The music of the show was interpreted by an eclectic mix of modern artists for the 2005 album Songs From the Neighborhood: The Music of Mister Rogers. The YouTube show Pittsburgh Dad uses a piano theme song inspired by the jazz music constantly heard on Mister Rogers' Neighborhood. The musical project Symphony of Science, in association with PBS Digital Studios, created a music video called "Garden of Your Mind" from clips of the show, using Rogers' own pitch-corrected spoken words to create a song. ^ a b Bianculli, David (February 19, 2018). "It's A Beautiful 50th Birthday For 'Mister Rogers' Neighborhood'". NPR. Retrieved February 19, 2018. ^ a b c Owen, Rob (November 12, 2000). "There goes the Neighborhood: Mister Rogers will make last episodes of show in December". Pittsburgh Post-Gazette Magazine. Retrieved March 20, 2011. ^ "Mr. Rogers says goodbye – for now". CNN. August 31, 2001. Retrieved February 20, 2018. ^ "A friend in a zippered cardigan". The Globe and Mail. February 28, 2003. Retrieved 2018-09-19. ^ "PBS Parents: Mister Rogers' Neighborhood series summary". ^ Millman, Joyce (August 10, 1999). "Brilliant Careers: Fred Rogers". Salon. Retrieved July 11, 2006. ^ a b Nededog, Jethro (July 31, 2011). "Fred Rogers' Legacy Lives on With a 'Mister Rogers' Neighborhood', Animated Spin Off From PBS". The Hollywood Reporter. Retrieved December 23, 2012. ^ Inc, Nielsen Business Media (January 31, 1998). "Billboard". Nielsen Business Media, Inc. Retrieved January 29, 2018 – via Google Books. ^ "Schedule Listings (Mountain) (Idaho Public Television)". idahoptv.org. Retrieved 2014-03-23. ^ a b c Hinckley, David (March 3, 2018). "Mister Rogers has become 'one of the coolest men on the planet'". New York Daily News. Retrieved March 5, 2018. ^ Sylvania Award page 1952-1958. Uv201.com. ^ "The Pittsburgh Press from Pittsburgh, Pennsylvania on January 15, 1956 · Page 110". Newspapers.com. Retrieved 2018-04-16. ^ "Obituary: Josie Carey / TV pioneer, star of 'The Children's Corner'". Pittsburgh Post-Gazette. Retrieved 2018-04-16. ^ "Our Small World – Fred Rogers Center for Early Learning & Children's Media". Fred Rogers Center for Early Learning & Children's Media. Retrieved 2018-04-16. ^ "Fred Rogers Biography". www.fredrogers.org. Retrieved 2018-09-19. ^ Interview with Fred Rogers, part 4 of 9 on YouTube. ^ a b "CBC: The original neighbourhood". CBC 75th Anniversary Website. Canadian Broadcasting Corporation. Retrieved January 2, 2012. ^ Montgomery, David (September 1, 2001). "For Mister Rogers, a Final Day in the Neighborhood". The Washington Post. Retrieved February 20, 2018. ^ Mister Rogers' Neighborhood Full Intro with Video on YouTube. Retrieved March 29, 2011. ^ "NMAH – Mister Rogers' Sweater". National Museum of American History. Archived from the original on July 3, 2007. Retrieved 2007-05-31. The red sweater, knitted by his late mother, was donated to the Smithsonian's National Museum of American History by Fred Rogers on November 20, 1984. ^ a b "Children's Museum of Pittsburgh: Welcome To Mister Rogers' Neighborhood". Archived from the original on July 19, 2011. ^ Owen, Rob (June 10, 2008). "Less 'Mister Rogers' in PBS's future". Pittsburgh Post-Gazette. ^ Dudek, Duane (January 28, 2010). "'Mr. Rogers' becomes too pricey a neighborhood". Journal Sentinel. Milwaukee, WI. Retrieved August 2, 2011. ^ Owen, Rob (March 28, 2012). "Tuned In: WQED puts daytime focus on children's programming". Pittsburgh Post-Gazette. "Mister Rogers' Neighborhood" at 11 a.m. and 1:30 p.m.
^ Pittsburgh Post Gazette (August 1, 2008). "Tuned In: 'Mister Rogers' fan launches Web site to save daily episodes". Pittsburgh Post-Gazette. ^ Weisman, Jon. (July 30, 2011) "PBS to air new series from Fred Rogers Co.". Variety. ^ "Mister Rogers' Neighborhood". February 19, 1968 – via IMDb. ^ "Mister Rogers' Neighborhood – Johnny Costa Pittsburgh's Legendary Jazz Pianist". ^ "Misterogers 1971" on YouTube. Accessed 08-09-09. ^ ''Amazon Video: Mister Rogers Neighborhood''. Amazon.com. ^ "Amazon.com: Mister Rogers' Neighborhood: It's a Beautiful Day: Fred Rogers: Movies & TV". Amazon.com. Archived from the original on April 2, 2018. Retrieved March 20, 2018. ^ Lambert, David (February 12, 2018). "Mister Rogers' Neighborhood – Official PBS Press Release for the 'It's a Beautiful Day Collection'". TVShowsOnDVD.com. Retrieved April 2, 2018. ^ a b c "Twitch Announces Marathon of PBS KIDS' Iconic Series Mister Rogers' Neighborhood". www.fredrogers.org. The Fred Rogers Company. May 11, 2017. Retrieved May 12, 2017. ^ Coburn, Randall (March 20, 2018). "Twitch to stream Mister Rogers Neighborhood marathon in honor of Fred Rogers' 90th birthday". Consequence of Sound. Retrieved March 20, 2018. ^ Fogel, Stephanie (March 19, 2018). "Twitch is Hosting a 'Mister Rogers' Marathon on His 90th Birthday". Rolling Stone. Retrieved March 20, 2018. ^ a b David Newell (August 31, 2001). ""Mr. Speedy Delivery" talks about his neighborhood" (Interview). Interviewed by Carol Lin. CNN. Archived from the original on December 29, 2007. ^ Rose, Joel (9 August 2010). "Joe Negri: From handyman to jazz guitarist". All Things Considered. NPR, National Public Radio. Retrieved October 4, 2012. ^ "Michael Keaton at Hollywood.com". Retrieved 2007-05-31. ^ "Children's TV Icon Fred Rogers Dies at 74". Fox News. Associated Press. February 27, 2003. Retrieved 2007-05-31. Joe Negri... said Rogers demanded perfection, refusing to accept shoddy ad-libbing by guests who may have thought they could slack off during a kids' show. ^ "Mister Rogers' Neighborhood". AOL@Television. AOL LLC. Retrieved 2007-05-31. ^ "Mister Rogers: It's You I Like". PBS. 3 March 2018. Retrieved 18 June 2018. ^ "5 ways to celebrate 'Mister Rogers' Neighborhood' on its 50th anniversary". USA TODAY. Retrieved 2018-03-08. ^ Brennan, Patricia (17 Mar 1990). "'Our Neighbor, Fred Rogers': A Look Behind the Cardigan" (Review). The Morning Call. The Washington Post. Retrieved 18 June 2018. ^ "Our Neighbor, Fred Rogers" (Library catalog entry). OCLC WorldCat. WQED (PBS). 1990. Retrieved 18 June 2018. ^ "Fred Rogers: America's Favorite Neighbor" (Library catalog entry). OCLC WorldCat. WQED (PBS). 2003. Retrieved 18 June 2018. ^ "Mister Rogers in Our Neighborhood". PBS. WUCF (PBS). 2018. ^ Haynes, Monica (October 31, 2004). "The Real Deal: Museum promises hands-on fun with "stuff"". Pittsburgh Post-Gazette. Retrieved 2007-05-31. ^ "The Sky Above Mister Rogers' Neighborhood". CommerSel Studios. Archived from the original on February 18, 2008. ^ "Idlewild and SoakZone – Attractions". ^ "Mister Rogers' play space moves in to Monroeville Mall". Pittsburgh Business Times. March 14, 2002. ^ "Mister Rogers back at Pittsburgh Int’l Airport" Stuck at the Airport, published February 24, 2009. Retrieved March 17, 2012. ^ "Mister Rogers' Neighborhood Archives". Collections in Other Repositories. National Public Broadcasting Archives. Archived from the original on June 23, 2012. Retrieved 5 September 2013. ^ Sostek, Anya. "Mr. Rogers takes rightful place at riverside tribute," ''Pittsburgh Post-Gazette'', Friday, November 6, 2009. Post-gazette.com (November 6, 2009). ^ "Hello, Neighbors: Focus Features To Release Mr. Rogers Documentary In 2018 – Birth.Movies.Death". birthmoviesdeath.com. Retrieved January 29, 2018. ^ "Mister Rogers & Me". A Wagner Bros. Film. 2010. Retrieved 18 June 2018. ^ "Mister Rogers & Me" (Library catalog entry). OCLC WorldCat. Retrieved 18 June 2018. ^ "Celebrating Mister Rogers". Google Doodle Archive. September 21, 2018. Retrieved December 8, 2018. ^ Fuoco, Michael A. (December 3, 2011). "'Pittsburgh Dad' is an Internet sensation". Pittsburgh Post-Gazette. "It's a Beautiful 50th Birthday for 'Mister Rogers' Neighborhood'". Fresh Air. National Public Radio. February 19, 2018 . 1984 interview with Fred Rogers.